Secure Outcomes designed the LS1100 with focus on three core values critical to law enforcement and military professionals: functionality, durability under pressure and quality. 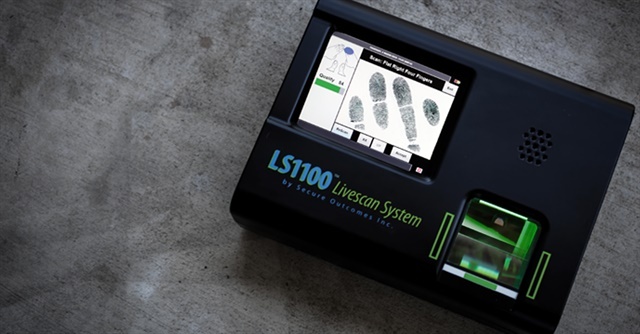 The LS1100 system is the only self-contained hardened single-integrated forensic quality livescan fingerprinting solution that was Designed by Cops for Cops™ for law enforcement professionals. The unit requires no external PC, wires, keyboard or mouse to provide maximum officer safety. The LS1100 condenses everything you know about fingerprinting down into the only portable forensic-quality livescan system that handles the hostile booking/jail environment and that also can be taken portable anywhere anytime. The LS1100 case is made from hardened ABS and steel with the police officer in mind. The system withstands the hostile jail environment and bolts down for added protection from your detainee. Quickly unscrew the wingnuts under the booking desk and remove to take the light 12 lb unit with you into the field. Power it up anywhere with the simple 12VDC accessory socket plug. The carefully thought out touchscreen graphical user interface and single integrated unit design enables you to keep 100% focus on the subject you are fingerprinting and that makes the LS1100 the most officer-safe system available. Our state of the art hardware coupled with proprietary advanced artificial intelligence software guarantees the best possible scanned fingerprint quality. The unit automatically transmits prints through the Internet direct to state/federal authorities with a rap sheet received back in minutes. Twice the performance. Half the price. Every time. The LS1100 is covered by four U.S. Patents 9,569,655, 9,342,732, 8,676,046 and 8,331,775 that protect the advanced artificial intelligence, crypto, configuration, GUI and other features of the system. Manufactured in the U.S.A. from domestic/foreign components. The LS1100 livescan system executes the functions critical to law enforcement at the booking station and out in the field. You control all functions in seconds simply by touching the integrated screen. Yes, it’s that simple. Every time. Scan and collect the 14 full-rolled/flat-slap fingerprints required for FD-258/FD-259 federal as well as state and local print cards. Data entry syntax checking to FBI standards stops text entry errors. Automatic self-scoring/grading of collected prints helps eliminate rejects. The included FBI Certified fingerprint card printer prints hardcopy fingerprint cards and criminal arrest records directly from the system with a touch on the screen. Archive as many as 100,000+ fingerprint sets in the integrated database for later retrieval to allow reprints, re-checking, charge code modification and more. With no external PC needed, the data is stored right inside the LS1100 unit itself. Transmit collected fingerprint datasets to state and federal authorities with a touch on the control screen. The LS1100 receives the FBI/state report typically in minutes. You will then know the real identify and detailed criminal history rap-sheet of your detainee. The deliberate versatility of the system enables you to put the LS1100 in your department, jail, patrol vehicle, mobile command unit or CID for fast identification and tracking. The LS1100 will provide terrific capability for any department, big or small! Secure Outcomes has digital fingerprinting solutions throughout the country in almost every state. The U.S. Army and U.S. Air Force use LS1100 livescan systems in the United States as well as overseas. Federal agencies including the Department of Veterans Affairs, the Federal Home Loan Bank with over $1.0-Trillion of assets as well as numerous federal airports trust and use our livescan systems. All Secure Outcomes systems are FBI/SWFT and state certified and transmit fingerprint datasets to FBI, TSA, SWFT/OPM, FBI Chanellers and state agencies. Our systems include full training, software/hardware warranties and, especially, access to our unique USA-based 24/7/365 telephone support hotline. The hotline support never ends even for out of warranty systems. We never abandon our customers! All of our systems ship to you fully pre-configured and ready to use right out of the box. We offer on-site delivery and training if you require that. The LS1100 has evolved over the past five years into a fully integrated software, hardware and support package guided by customer needs and feedback. When you order a system from us, we work with you to get required transmission permissions and security settings setup and also pre-configure your system so that it is ready to go when it arrives. -LS1100 digital livescan fingerprinting system. -The extensive control software package fully installed and configured. -FBI Certified hardcopy fingerprint card printer. -Full training via Internet remote access and reference DVD video. -Access to our 24/7/365 telephone support hotline forever. -Integrated mugshot camera and control software. Secure Outcomes is a 100% American company and all of our product development and customer support is headquartered in Colorado and always will be. Period. Military users of the LS1100 system include the U.S. Army and U.S. Air Force both in the United States and abroad. All Secure Outcomes livescan systems are fully certified for SWFT/OPM transmission. Military customers use the LS1100 for military police criminal arrests and investigations as well as for background checks for military, government and civilian employees. Secure Outcomes offers military grade fingerprint data encryption with the LS/Crypto™ upgrade. This high-level encipherment package uses AES-256, SHA-256, and a Blum-Blum-Shub random number generator seeded by well-defined system entropy in a patented special crypto fingerprint data protocol to assure secure storage and transmission of sensitive fin­gerprint and personnel data. LS/Crypto is a separately priced option and requires special Department of Commerce/Department of State licensing for export. Small and compact at 15”x12”x6”. No bulky archaic kiosks with our livescan gear! Light weight at just 12 pounds. Hardened ABS and steel case - Same rugged material as used in NFL football helmets. 500PPI fingerprint scan device platten area: 3.75” x 3.50” (9.53cm x 8.89cm) to FBI specifications. nternal green illuminating print LED light source with 200,000 hour MTBF. Available in MIL SPEC 810F. Rugged internal integrated single board process control computer with Intel 2.5Ghz+ multi-core processor for fast response. Integrated 8.4” color SVGA touchscreen with 800x600 pixels and 16.7-million colors. CD/M2 luminance with -80 to +80 degree horizontal and -60 to +80 degree vertical viewing angle. Color touchscreen with 3H anti-glare hard coating surface treatment with extreme longlife LED backlight. Solid state SSD disk drive with no moving parts. Power requirement: +6VDC to +48VDC at 14-watts average (580ma at +24VDC). Universal input brick included. Portable use with power from 12VDC patrol car accessory socket. We build digital livescan fingerprinting systems. That is all we do – and we are very good at it. Simply, the Best on this Planet!® That is the Secure Outcomes philosophy. We spent millions of dollars designing and perfecting the new livescan technology that we have brought to market. That technology mixes advanced artificial intelligence software with state-of-the-art hardware to yield fingerprint livescan systems that are the easiest to use, the most cost effective and the most compact and officer-safe and integrated available. Designing and building easy to use software like ours is very hard. Our software is a breeze and joy to use and we pride ourselves on that. All of our systems are FBI Certified and patented and patent pending. In addition, we pride ourselves on building livescan systems for law enforcement and military environments that are officer safe. I tell you that you will also find that we offer the best customer service – and we don’t charge an arm and a leg for that. We configure and thoroughly test your livescan system before packing and shipping it to your site. Next, we walk you through how to use the LS1100 over the telephone while we watch and critique in real-time through the Internet as you quickly learn how to roll livescan prints. Livescan fingerprinting is a bit different from the old ink and roll paper methods and we get you through that learning curve in just a few minutes to where you quickly become expert. We also offer quality optional capabilities such as integral mugshots – again at very attractive pricing. Please contact me direct at [email protected] if something is not right or if something does not meet your expectations. We will make it right! U.S. Patents 9,569,655, 9,342,732, 8,676,046 and 8,331,775.